Industrial Hydraulics, Material Handling Equipment, Pneumatics Systems, Industrial Automation & Allied Equipment. 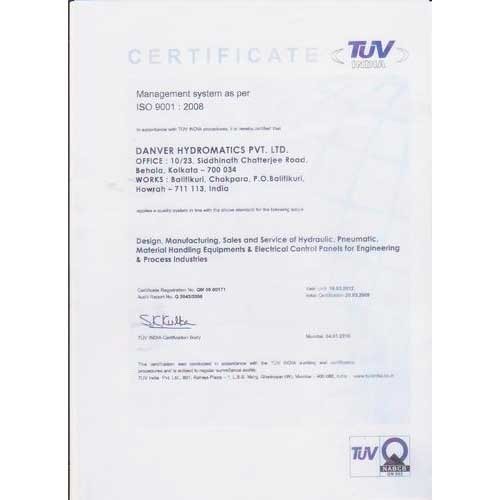 Danver Hydromatics Private Limited' are a professionally driven company with our underlying interests in the field of industrial hydraulics, pneumatics systems, industrial hydraulic cylinders, double acting hydraulic cylinders, hydraulic presses, material handling equipment and industrial automation equipment. Established in the year 2004, we are manufacturer and exporter of a wide gamut of industrial equipment and system integrator for Siemens, Germany. Our endeavors also include turnkey solutions for our clients. Our company is gradually evolving to establish a reputable position in our domain. Our adroit personnel and our sound infrastructure have helped us develop our assortment of industrial automation and other equipment in strict accordance with our client’s requirements. Being quality conscious we deliver our consignments within the promised time frame that has etched us to the preferential list of our clients. This is the reason we have been able to make in roads in various markets of the world. Being a client centric company, we direct all our endeavors in surpassing the expectations of our clients. We strive to satisfy our clients through excellence and commitment to impeccable quality. Maintaining consistent quality measures and developing customized solutions for our clients has made us their preferred choice. Our dedicated and sincere efforts in terms of custom-made range and client specific packaging are immensely appreciated by our global clientele. Also, our ability to provide PLC based turnkey solutions has been a plus point for us and has helped us develop great rapport with numerous clients. We supply an extensive collection of industrial hydraulic, automation and other equipment that is widely acclaimed by our customers. Our quality assured gamut entails Automation, Drive System, Hydraulic Seal, Hydraulic, Project and Special Purpose Machines. The Automation Systems of our range include Control Desk, Control Panel, Electrical Control Panel and Industrial Automation. Our Drive System highlights equipments like Clutch Type Coupling, Drive System, Gear Box with Drive and Variable Speed Drive for Conveyor. We offer our Hydraulic Range in the form of a wide collection of Industrial Hydraulic Cylinders, Double Acting Hydraulic Cylinders, Hydraulic Power Packs, Power pack With Control Panel and Valve Stands. The comprehensive collection of Conveyors provided by us includes Loading Unloading Conveyor, Overhead Conveyor, Ratchet Type Conveyor and Radiation Plant. Our assortment of Special Purpose Machine encompasses Bogie Drive, Contact Heater, Hydraulic Scissor Lift, Portable Filtration, Pressure Structure, Pressure Testing Machine and Scissor Lift. We provide hydraulic systems for Various functions in steel and processing industries as listed below. We are backed by a dexterous team of professionals whose unremitting efforts and perseverance has helped us manufacture our assortment of industrial hydraulics, automation and allied equipment with unblemished quality. Our adept personnel are instrumental in understanding the exact demands of our clients and developing range as per their specifications. All our staff works as a cohesive unit towards achieving the individual and organizational goals, with a clear objective of taking our company to new heights of success through optimum quality and client satisfaction.